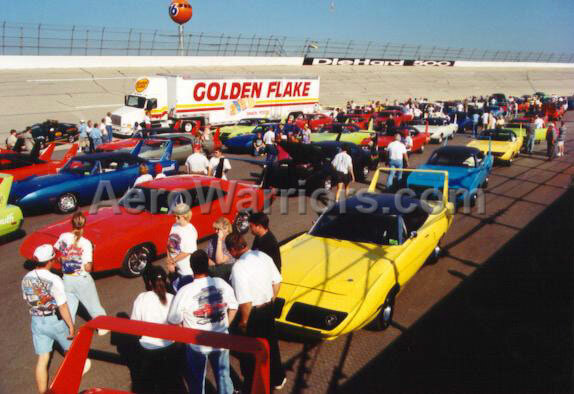 With 151 cars registered (82 SuperBirds, 49 Talladegas and Cyclone Spoilers, eighteen Daytonas and two Charger 500s), the 1999 Aero Warrior Reunion officially became the largest gathering of Ford and Chrysler aero cars ever. And when this record attendance was combined with great weather, entertaining guests and Chrysler's announcement of their return to NASCAR Winston Cup, it may also have become the greatest Reunion ever! Thursday, October 14 saw a majority of the Reunion participants arrive in Birmingham, Alabama. The headquarters hotel for the Reunion, the picturesque Sheraton Perimeter Park South, is located several miles southeast of downtown Birmingham. 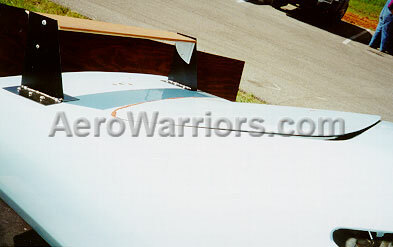 This is 1999 Aero Warrior Reunion organizer and director Tim Wellborn. He rehearsed for this monumental affair by hosting similar Reunions in 1988 and 1994. Tim would be the first to say that without the efforts of many people, including Mark Moses and Doug Schellinger, the Reunion would not have been possible. Here, Tim is posed with the #71 K&K Insurance Daytona, a car which he played a big part in restoring. Tim travels with the #71 when Daimler-Chrysler wants to use it for an exhibit or other special event. On his last trip for Daimler-Chrysler, Tim drove the car on the exotic Formula 1 venues of the Nurburing in Germany and Silverstone in England. It's a tough job, but someone has to do it! Registration for the Reunion got underway Thursday evening at the Sheraton. Tim Wellborn and his crew had an "assembly line" set up near the lobby, passing out goody bags, selling shirts and answering questions about the upcoming events. Although scheduled for an hour, registration lasted nearly two hours as the number of people in line and the brisk shirt sales were apparently greater than anticipated. The wait didn't seem long however, as most folks in the queue had much to talk about with those in front and/or behind them. There were a variety of shirts available, and most were sold out well before the last registrant made it though the line. Arrangements were made to mail shirts to those who were unable to purchase them during evening registration. Friday morning's agenda called for a trip to the International Motorsports Hall of Fame for the first day of a two day car show. Organizing and maintaining a convoy of almost 100 vehicles over 45 miles is a bit tricky, and the aero car group became somewhat fragmented as it snaked through unforgiving stop lights and rush hour traffic. 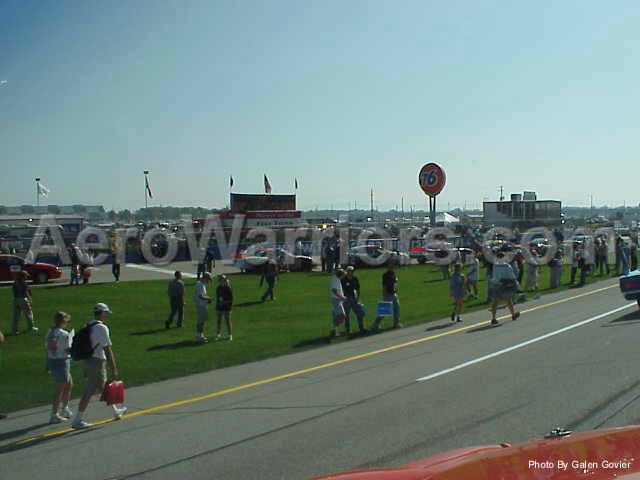 Because the Hall of Fame lies adjacent to Talladega Superspeedway (it's less than a half-mile from the huge track), aero cars and other race fans mixed in traffic as the procession approached the race facility. Traffic was not especially objectionable though, as the number of race fans attending on Friday is significantly less than for the remainder of the race weekend. And the brief wait for those not involved with the Reunion must have been a memorable one, seeing Ford and Chrysler aero cars peppered throughout the lines of vehicles. 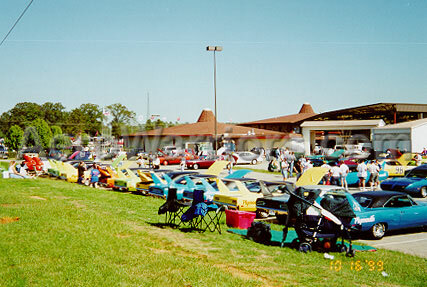 Eventually all of the aero cars made it to the Hall of Fame, breaking away from the race crowd and entering the fenced-off facilities of the Hall of Fame just after entrance into the Talladega grounds. Those that have attended past aero car events at the Hall of Fame complex were pleasantly surprised to find a much expanded facility this time around. Adjoining the original building is the Speedvision Dome, which more than doubles the Hall of Fame's floor space and grounds. These expanded grounds served as the gathering area for the 100 or so aero cars that convoyed from Birmingham. Co-Reunion organizer Doug Schellinger, head of the Daytona-SuperBird Auto Club, carefully directed cars as they entered the grounds in preparation for a special photo that was to be taken a bit later. The cars eventually ended up in several giant semi-circular rows, all of which were centered around a twenty foot high platform holding a large camera. As folks emerged from their cars, the sound of engines from the nearby track could be heard - this almost eerie engine whine would be a fixture throughout the aero cars' two day stay at the Hall of Fame. The weather looked a bit threatening at first, but soon after the group's arrival most of the clouds decided to go elsewhere and the sun made an appearance. 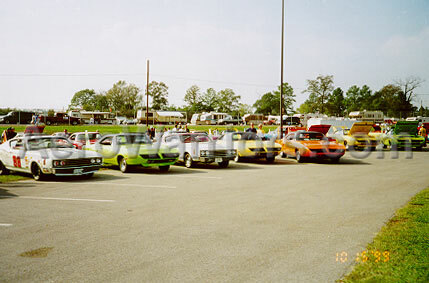 The Friday car show at the International Motorsports Hall of Fame was especially exciting because of the panoramic photo that was taken. Portions of the giant semi-circle car rows formed for that panoramic shot can be seen in five of the above photos. Pictures two and three in row one also show the additions made to the Hall of Fame since the last Reunion in 1994. (Row one, photos two and three by Randy Morrison). 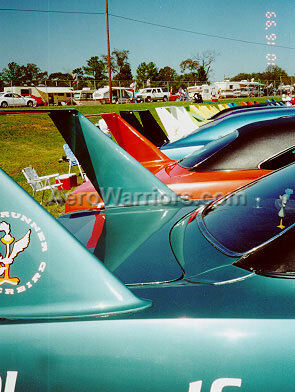 ROW TWO, PHOTO THREE: Many may remember Jim Fredericks and his record breaking Plymouth SuperBird Fly Rod. Jim set a record of 216.392 MPH in the B-Altered Coupe Sedan class at the Bonneville Salt Flats in the 1980's. The car seen here was formerly owned by Jim, and is a sister car to the Fly Rod. 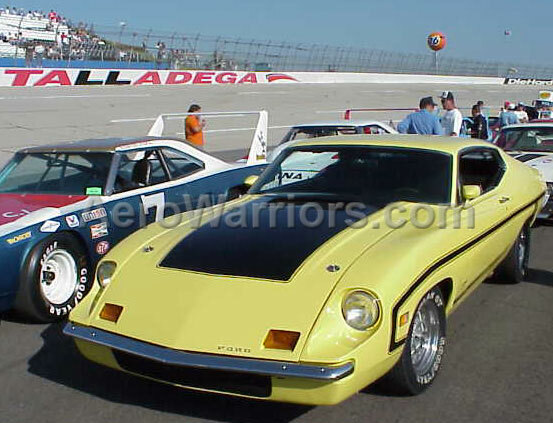 It never saw race duty, but is a 19,000 mile survivor that has been cosmetically restored. ROWS ONE AND TWO: The Saturday show saw even more cars in attendance than the Friday event, and more spectators as well. The weather couldn't have been better. The brown-roofed building in the first two photos is the original Hall of Fame complex - the third photo in the first row shows a portion of the Speedvision Dome building at left. 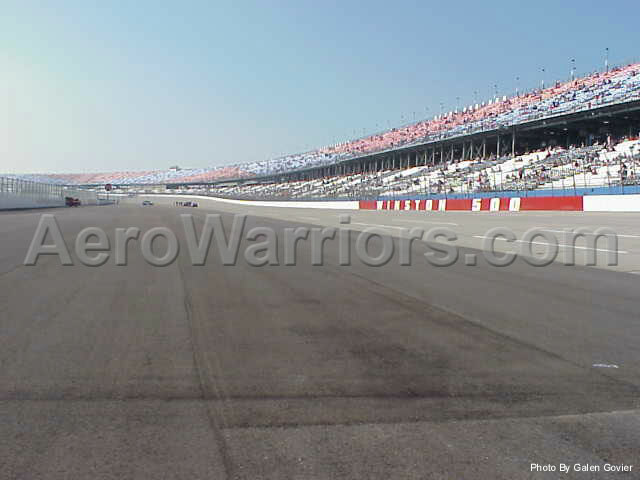 On the right in this same photo, far in the background, is the main grandstand at Talladega Superspeedway. ROW THREE, PHOTO ONE: Arguably the rarest and most desirable aero car at the show (at least among the Ford contingent) was this 1970 Ford King Cobra. 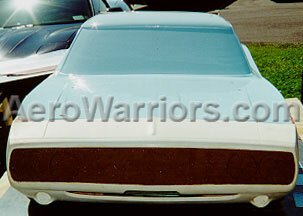 It was going to be Ford's next shot in the Aero Wars, but they left NASCAR racing before the car could be produced. This is one of three prototypes manufactured, is owned by Steve Honnell, and is powered by a NASCAR spec 429 Super Cobra Jet. Someday, the tree in the foreground will be able to tell its grandchildren about the day that one of the rarest Fords in history parked beside it. 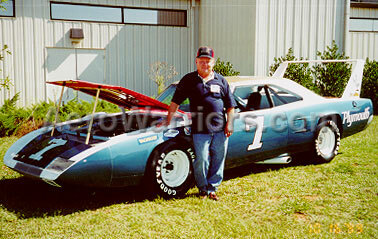 ROW THREE, PHOTO TWO: Harry Lee Hyde, son of NASCAR champion crew chief Harry Hyde, poses with the Ramo Stott SuperBird. Harry Lee was available to talk to Reunion participants much of the weekend, sharing a great deal of his knowledge about the aero car years when he was a crew member on the #71 K&K Insurance Dodge Daytona race team. 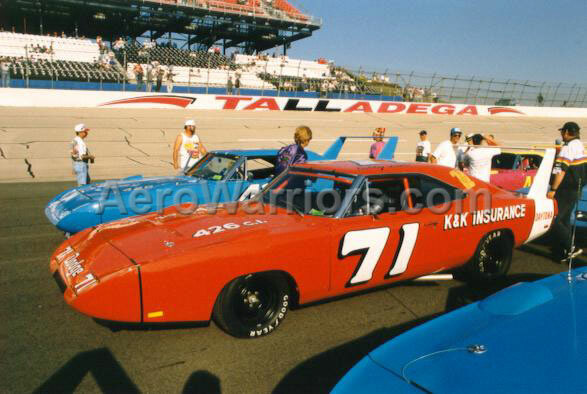 Driver Bobby Isaac and the K&K team went up against Ramo in his SuperBird at Talladega in August of 1970 - Ramo finished eighth, six places behind Isaac who captured a second place finish. 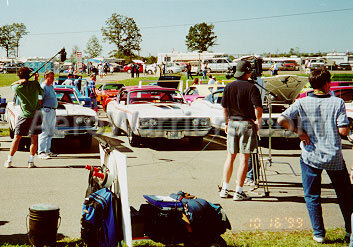 ROW THREE, PHOTO THREE: The cable television show American Musclecar videotapes a Mercury Cyclone Spoiler II and its owner for a broadcast. 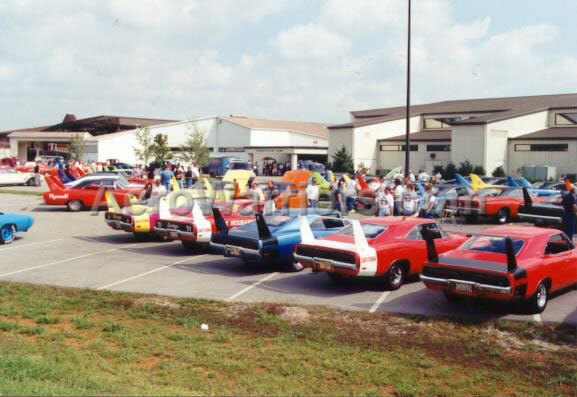 Several owners were lucky enough to have the opportunity to talk about their cars for American Musclecar, which airs on the Speedvision cable channel. Crews from both American Musclecar and My Classic Car (which also covered the event) were very professional and made those not used to being on camera feel very much at ease. 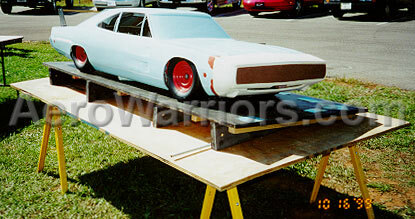 Chrysler's 3/8 scale Dodge Charger wind tunnel model made an appearance. During the development phase of the Dodge aero cars, this model provided quite a bit of information to Chrysler on how various body configurations would react aerodynamically. And because of its relatively small size, it could be tested in the more readily available (and much less expensive to use) smaller wind tunnels of the day. ROW ONE: Among the unusual parts on display were the nose off Sal Tovella's USAC racing SuperBird, (bottom and top views), and a portion of a quarter panel off one of Richard Petty's SuperBirds or Road Runners. 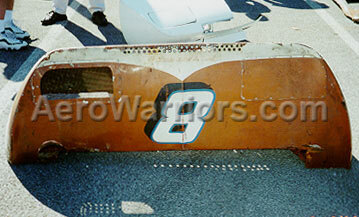 ROW TWO: The first photo shows a rear window plug piece from one of Charlie Glotzbach's #99 racing Daytonas. 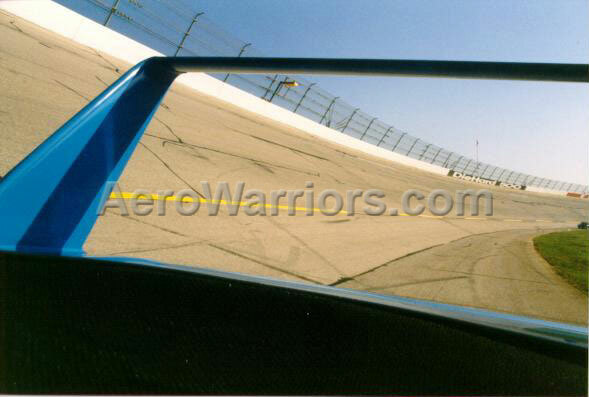 The next two shots are of a hand held template tool used by Creative Industries to properly place the spoiler and license plate bracket holes in Dodge Daytona noses. 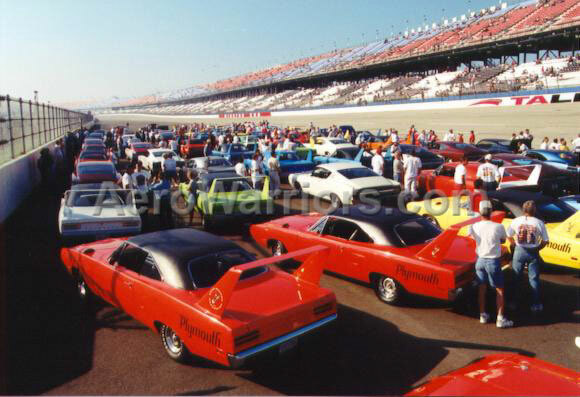 ROWS ONE AND TWO: The cars are gathered near the entrance to the pits, waiting to complete the lap at Talladega Superspeedway. Drivers and passengers were afforded several minutes here to leave their cars and get a better look at the Speedway from an area that most will never have an opportunity to visit on race day. (Row one, photos one and three by Wayne Perkins. Row one, photo two and row two, photo three by Galen Govier. Row two, photos one and two by Randy Morrison). ROW THREE AND FOUR: Here, the aero cars are on their way around the track. The lap speed was slower than expected, but given the number of people standing very near the cars as they were moving down the frontstretch, this was no doubt a good thing. (Photo one in row three by Randy Morrison. 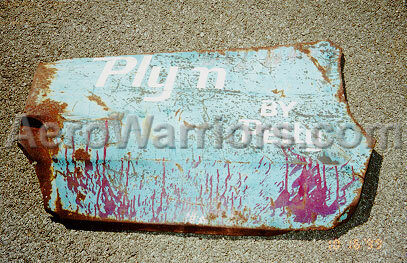 Photo two in row three by Wayne Perkins; the remaining photos in rows three and four by Galen Govier). 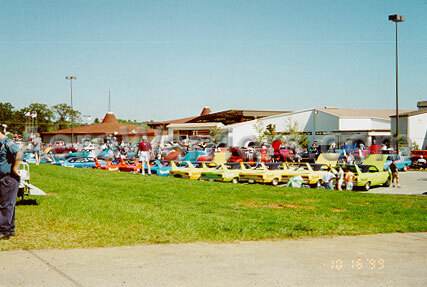 ROW FIVE: The first two photos show the cars parked in the staging area immediately after completion of the parade lap. 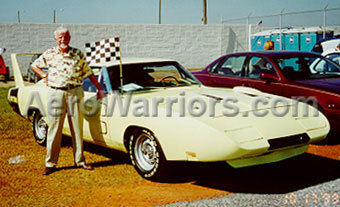 The third photo is of former Daytona and SuperBird driver Dr. Don Tarr, who led the parade lap in his own Dodge Daytona. 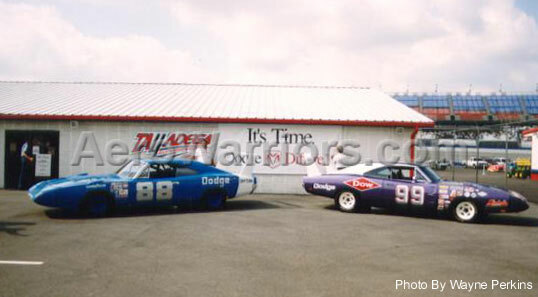 Don was given this car by one of his sponsors, Biscayne Dodge of Daytona Beach, Florida, after his appearance in the inaugural race at Talladega in 1969. Shortly after this photo was taken, Don took the Daytona to the International Motorsports Hall of Fame where it will be on display in the near future. Don was wonderful to talk to, and he eagerly shared his wealth of knowledge about stock car racing. At 70 years of age, Don is still going strong. More Reunion photos taken by Galen Govier, Randy Morrison and Wayne Perkins are available for viewing. Each of the car owners below were honored with a "Star of the Show" trophy from the Reunion organizers. 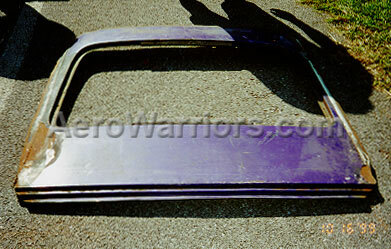 Gary Starkey Mercury Cyclone Spoiler II. (38 sec. - 609K) - Low Volume! Bob Malcom Dodge Charger Daytona. (45 sec. - 735K) - Low Volume! NOTE: Charger 500 owner John McBryde was not in attendance at the meeting and therefore did not receive his trophy at that time. 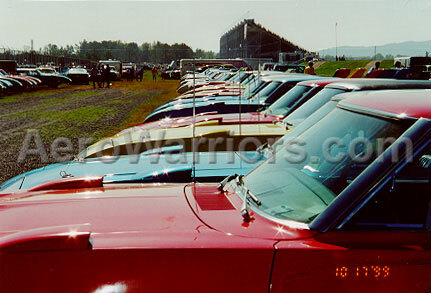 Five-Star Productions is offering a 105 minute video of the 1999 Aero Warrior Reunion. The cost is $24.00 (payment is by check or money order) - specify tape #1164. 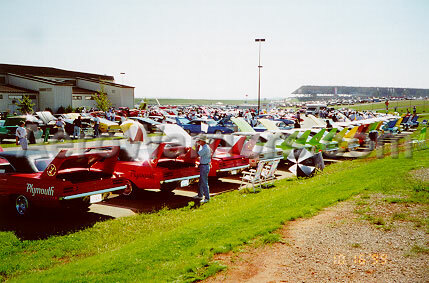 Five-Star has a large selection of other videos, including several of past winged car events. Call or write for a complete list. If several videos are ordered at the same time, the cost per tape is significantly reduced. An hour or two after all cars arrived and were positioned, the command was given for the owners, their families and friends to rejoin the cars. On the twenty foot high platform, the photographer Johnpaul Harris manned his camera. Not just any camera by the way, but a 100 year old piece that can take wide-angle, panoramic style photographs. Everyone was cautioned to stay perfectly still, and Johnpaul clicked the shutter. The motor driven camera began a 30 second rotation through the 180 degree arc of vehicles. Two photos were taken, and at the conclusion of the second, spontaneous applause broke out as most everyone sensed that they had just participated in a little bit of history. This photo will no doubt be one of the most spectacular ever taken of the Ford and Chrysler Aero Warriors anytime, anywhere. A black and white proof of the photo was to be available for viewing the following day. After the photos were taken, folks were again free to mill about, look at the cars, renew old acquaintances and make new ones. Race fans attending festivities at the track also walked the grounds, seeing the remnants of racing history that took place before many of them were even born. Race fans and Reunion participants alike also toured the three large display areas inside of the Hall of Fame, which held a very impressive display of more than 100 racing automobiles. Donnie and Bobby Allison were also on hand in the early afternoon to sign autographs and speak with fans. Speedvision's My Classic Car and American Musclecar were both at the show Friday conducting selected interviews for upcoming broadcasts. A number of Ford, Mercury, Dodge and Plymouth owners were interviewed with their cars. Neither of the show's crews were able to give exact air dates, but it would seem reasonable to expect the initial dates to be in the Winter or Spring of 2000. Information on air dates will probably become available on the My Classic Car and Speedvision Web sites. As the show was underway at the Hall of Fame complex, Chrysler held a press conference at nearby Talladega Superspeedway to further discuss the previous day's announcement concerning their return to Winston Cup. In preparation for this press conference, Chrysler had requested that Tim Wellborn attempt to locate a #99 Glotzbach Daytona that could be used as part of a photo backdrop. As it turned out, Wayne Perkins was planning on attending the Reunion in his street Daytona, which was beautifully detailed as the #99. Wayne spent most of the day at the location of the press conference, seeing and/or meeting many of the principles. Unfortunately, later in the day while heading back to the hotel, Wayne was involved in a traffic accident while attempting to assist another winged car along the side of the road. While all persons in the accident are doing well, the Daytona sustained significant damage. Special mention should go to Sean Machado who damaged a rod bearing sometime during his drive from California. The damaged bearing made itself known just as Sean entered the Hall of Fame Friday morning. Throughout Friday and Saturday (he left the car at the Hall of Fame Friday night), Sean and an intrepid group of friends and new acquaintances changed the offending rod bearing. They apparently did a very good job under rather tough circumstances, as Sean made it back to California without any problems! The car show continued throughout the afternoon, with most participants heading back to the hotel around 4 PM. Traffic away from the track was moving well, and the 45 mile trip back to the hotel for the several mini-convoys typically took less than an hour. Saturday morning saw a return trip to the Hall of Fame for day two of the show. Participants were told to leave at their leisure, so no large convoy was planned as had been the case on Friday. Traffic was heavier than the day before, as the weekend-off crowd was heading to the track. Plans originally called for a Saturday car show in a lot owned by a business adjacent to the hotel, but last minute insurance related fees levied by the business (amounting to $800 or more) made that an impossibility. As it turned out, a second day at the Hall of Fame worked out very well. 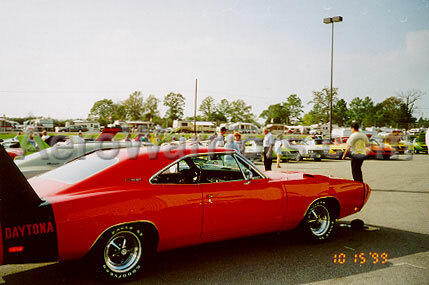 Saturday was to be the larger car show in terms of attendance, as a number of Reunion folks could not arrive and participate until the weekend. And, because of increased activities at the track, the number of spectators visiting the Hall of Fame and looking at the cars was also significantly greater than on Friday. The American Musclecar television program continued its videoing, the #71 K&K Insurance Daytona was fired up, and Harry Lee Hyde and Gary Romberg made appearances to talk to attendees throughout the day. A black and white proof of the previous day's panoramic photo was on display for inspection. As was hoped, the photo was spectacular. 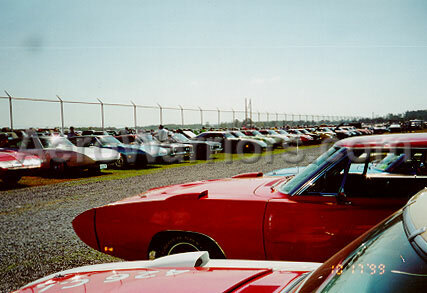 At about ten inches in height and approximately 60 inches in width, it was able to capture the 100 or so cars on the grounds of the Hall of Fame. Many of the Reunion participants appearing in the photo signed the proof, making it truly a one of a kind collector's item that will stay with the photographer, Johnpaul Harris. The first photos were to be delivered to Reunion participants in November. A number of unusual Chrysler parts and pieces were on display Saturday. 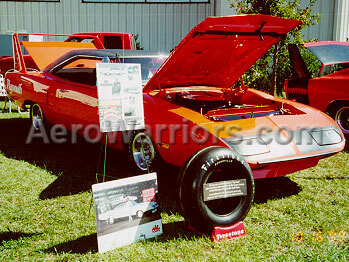 Foremost among them was probably the 3/8 scale Dodge Charger model used for wind tunnel testing by Chrysler. 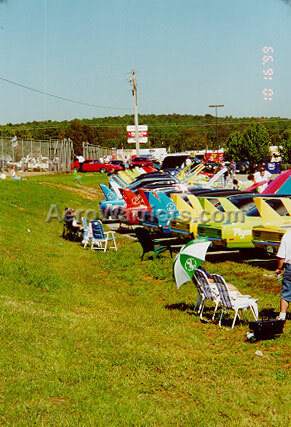 Free ARCA race tickets were also available, so several aero car enthusiasts walked to the track to watch the race in the early afternoon. The day seemed to pass even more quickly than Friday, with most cars departing the Hall of Fame by about 6 PM. Traffic was expectedly slow, although not overly objectionable as law enforcement officials had most inbound lanes allowing outward traffic flow only - a very good idea! A meeting for Reunion participants was scheduled to begin at the Sheraton at 8 PM, and no one wanted to be late. As it turned out, the meeting room was filled to standing room only well before the scheduled 8 PM start. The meeting got underway with Reunion organizer and director Tim Wellborn making welcoming comments, which included a mention of the fact that some had come from as far away as British Columbia and Washington State! He also talked of the late Monroe Schellinger, whom he had known and worked with on previous occasions, including the 1988 Reunion. When Tim finished, co-organizers Doug Schellinger and Mark Moses added their thoughts. Although there was no formal judging of cars, Wellborn, Moses and Schellinger did single out a few cars that they felt deserved special recognition, which they called the "stars of the show". Each of the owners of the cars singled out for recognition received a beautiful trophy bearing the "star of the show" phrase. After comments by the awardees, it was time to hear from the stars of the meeting, the guests who played very special roles in the lives of the aero cars. 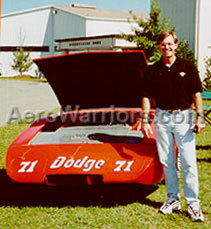 First up was then (and now) Chrysler aerodynamicist Gary Romberg. Gary's opening comments included some thoughts on how excited he was about Chrysler's return to NASCAR Winston Cup racing. Because Gary still works for Chrysler, it's likely that he may play a significant role in their efforts. After concluding his comments, Gary opened the floor up for questions. 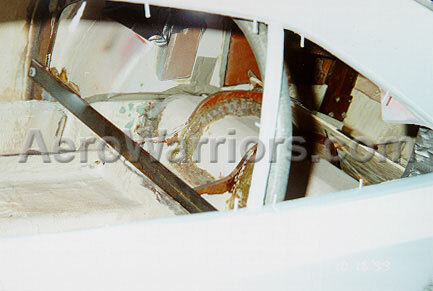 One of the first concerned the Daytona and SuperBird fender scoops, and Gary shared his belief that they were included on the cars for nothing other than tire clearance. 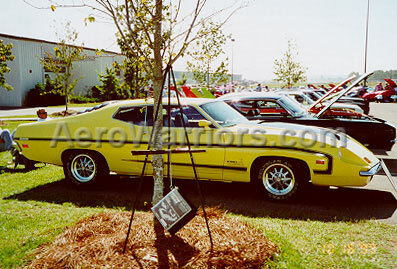 Another question dealt with whether Chrysler bought Ford aero cars to evaluate their performance, as Ford was known to have done with various Chrysler vehicles. 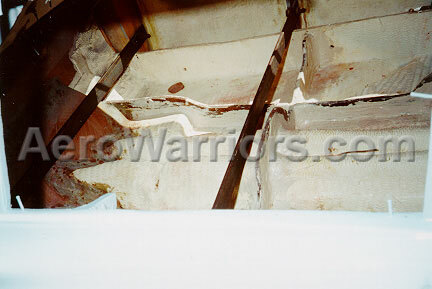 Gary indicated that he had no knowledge of Chrysler ever doing that. After a number of questions were answered, Gary surrendered the podium to Harry Lee Hyde. Harry Lee Hyde spoke in a southern drawl that seems almost a requirement for NASCAR team members of the 1960's. He began by recounting how he joined his father, K&K Daytona crew chief Harry Hyde, after returning in February, 1969 from a two-year stint in the Army. Harry Lee was on the pit crew for many years, including the period of time that encapsulated the team's 1970 championship season and their 1971 record breaking runs at the Bonneville Salt Flats. Also mentioned among his comments was the fact that the K&K team would "fudge" a bit on the rules when they thought they could get away with it. Although retired from active participation in NASCAR, Harry Lee still turns a wrench or two. He recently set up the suspension on the #71 before it was taken overseas and driven hard by Tim Wellborn in England and Germany. Harry got some laughs when he talked about how easy it was to adjust the suspension on the #71, but when he tried to do the same thing on his wife's new Intrepid, he had no success what so ever! A question was asked about the number of people on the K&K crew - Harry Lee indicated that their team (considered well financed at the time) had nine members! He also reported that the team maintained three Daytonas and three Charger 500's, although not all six were race ready at one time. When asked what happened to the cars, he reported that their first winged car was the #71 which now resides in the Hall of Fame Museum; that a couple were trashed due to serious accidents, and the Arringtons and Kesolowskis may have bought the remaining ones. 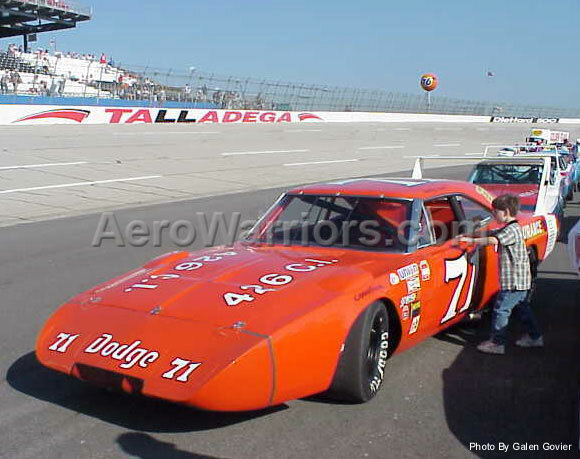 Appropriately, Harry Lee (and his grandson) were the ones designated to take the #71 around Talladega Superspeedway the following morning. Next up with comments was Dr. Don Tarr. Don had 48 starts in NASCAR events from 1967 to 1971, including six in a winged car. His best winged car performance ended with a sixth place finish in the Firecracker 400 on July 4, 1970, driving Richard Brown's SuperBird. 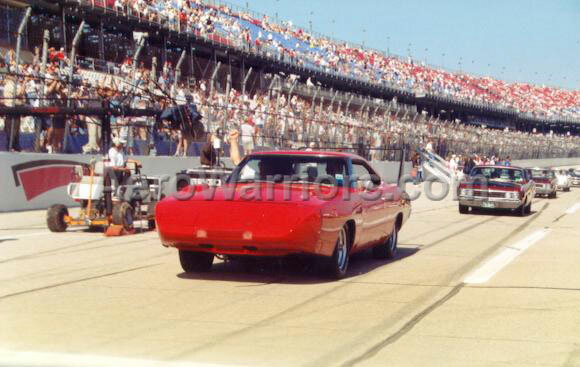 Don also drove in the inaugural race at Talladega in September of 1969 (in a '67 Dodge), leading a total of six laps before going out with engine problems. Tarr retired in the early 1970's after he lost his Coca-Cola sponsorship. At age 70, Don is a man on the move. He is chairman of his local building development board, owns a hotel, practices medicine part time, and still has time to pursue other interests such as ping pong where he is a former champion. Don began by sharing his thoughts on the 1969 Talladega 500, where he drove "like an idiot" (his words! 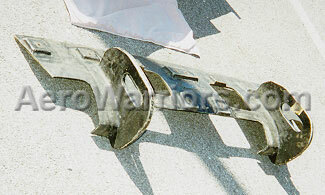 ), using up 22 tires in the 129 laps he spent on the track. Unlike many of his competitors, Don decided not to try to conserve his tires and lapped many of the cars at least once. He also expressed amazement at the number of people attending the Reunion, having his wife stand up to take a picture of the meeting attendees so that he could show the folks back home. Don entertained a number of questions, giving opinions on the winged cars from the perspective of someone who actually drove them in competition. There was no disguising the disappointment among Ford and Chrysler enthusiasts alike that speakers from the Ford camp did not attend. Ralph Moody had been invited and was expected to be present, but Tim announced during the meeting that the 82 year old Moody's health simply would not allow it. Some time was spent during the meeting discussing the possibility of joint Ford and Chrysler events in the future. It seemed to be the consensus (or at least no strong vocal opposition was offered) that joint meets would be a good idea. Although brand loyalty tends to run deep among aero car enthusiasts, most can step back from their strong feelings long enough to objectively understand the benefits to be gained from learning about and appreciating the competition. When the formal meeting concluded sometime after 10 PM, many people remained just to talk and to visit the small display of aero car items at the rear of the room. Among those items were Mark Moses' amazing set of Ford and Mercury racing car photos. After leaving the meeting room, it was then soon to bed for most, as it would be a short night's sleep. The convoy to the track Sunday morning was to leave at 5:30 AM sharp! Sunday, October 17's activities began well before sunrise, as making it to the track before most of the 100,000 plus NASCAR fans was a priority. 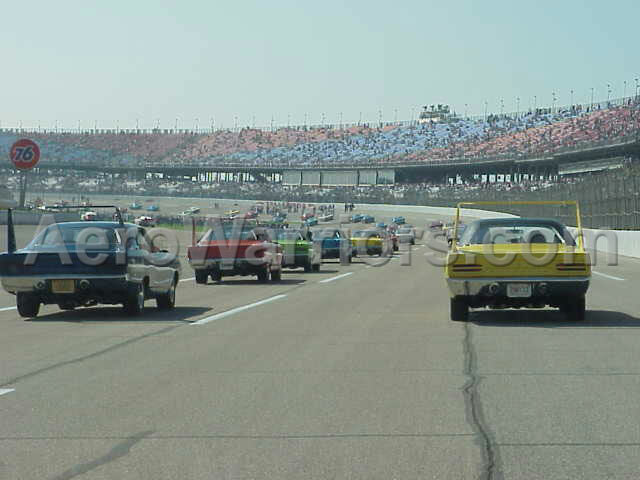 Talladega has never been known for flawless race day traffic flow, but leaving the hotel by 5:30 AM for the 45 mile trip to the track worked well, as the traffic was very manageable. 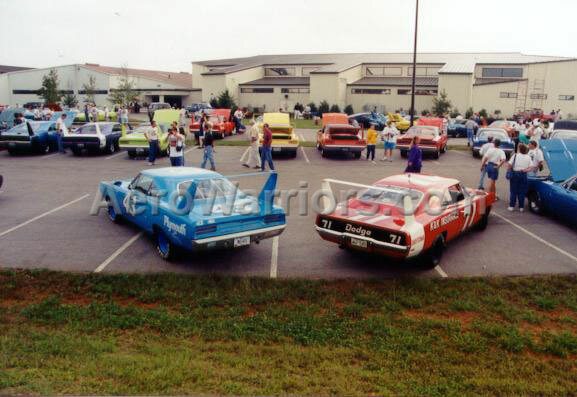 Once at the facility, Reunion cars filed into a huge parking area behind the track adjoining the backstretch. 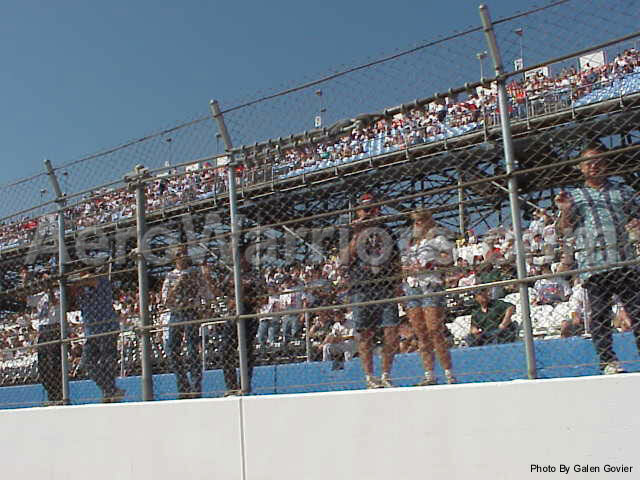 The cars fell in line, two-by-two, just inside a gate to the fence that spectators passed through on their way to the backstretch grandstands. The next few hours offered an excellent opportunity for talk among Reunion attendees, visits with race fans that stopped to look at the cars, and the chance to take a closer look at the massive track that is Talladega Superspeedway. 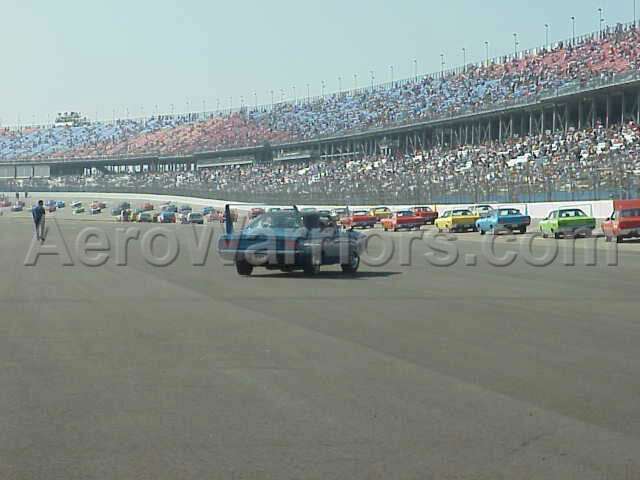 The Superspeedway is huge, and seems especially so to persons not routinely around large race tracks. 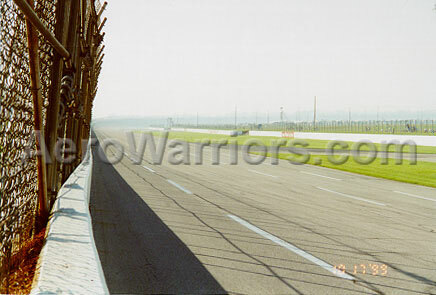 Standing at the turn three crossover (where the aero cars entered and exited the track) and looking left presents a back straight that appears to go on forever, while peering to the right reveals a massive high-banked turn that eventually disappears behind the infield clutter. It seems obvious almost immediately upon seeing the track that even the most timid driver could gather a lot of speed there and feel relatively comfortable, as the width of the track would offer much forgiveness to a driver inexperienced at higher speeds. The thought of being one of 40 racers heading into the turns at 190 MPH is definitely another thing however - after seeing the track up close some might wonder if they are really paying those millionaire racing drivers enough! The call went out about 9 AM for folks to get in their cars and proceed onto the track. 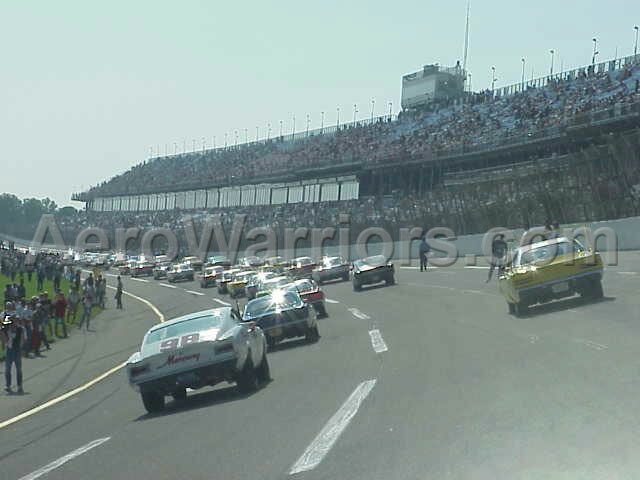 It was about 50 yards from the staging area to the entrance to the track, and it took several minutes for the over 100 cars to enter the Superspeedway and move slowly around the bottom of turns three and four. 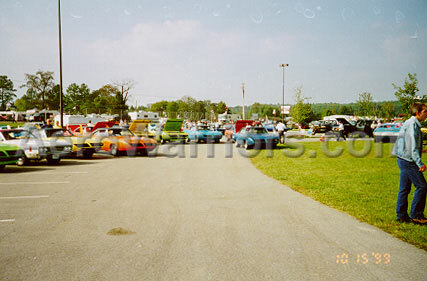 The convoy was eventually halted near the entrance to the pits, where the cars were formed into several rows. Drivers and passengers then exited the cars, took photos, and admired the crowd admiring them. 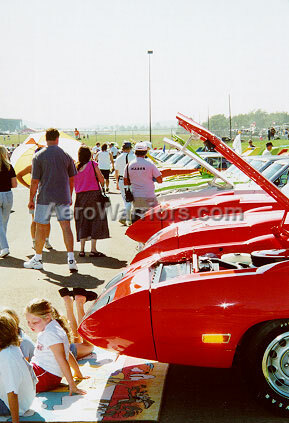 Also during this time some NASCAR race team members came from the pits to see the aero cars. Around 10 AM the order was given to fire up the cars once again, and the rest of the lap was underway. Reportedly two laps were originally on the agenda, but apparently NASCAR changed its mind at the last minute and only one lap was completed. 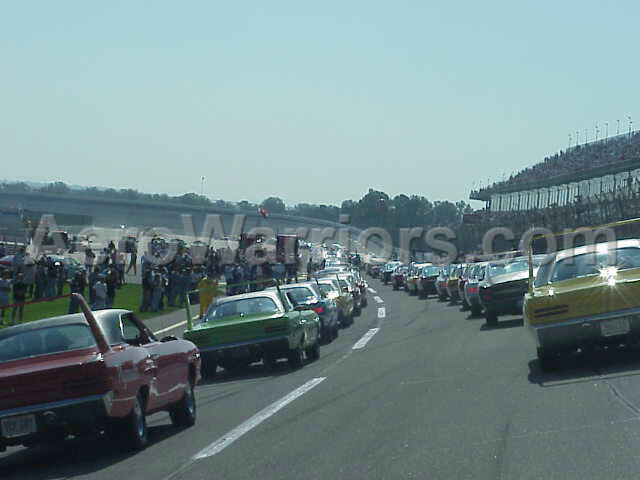 Because the parade lap was taking place a couple hours before the race, the grandstands were far from filled to capacity while the lap was underway. The grandstands are so massive, however, that what appeared to be sparsely populated seating was in actuality many thousands of people. 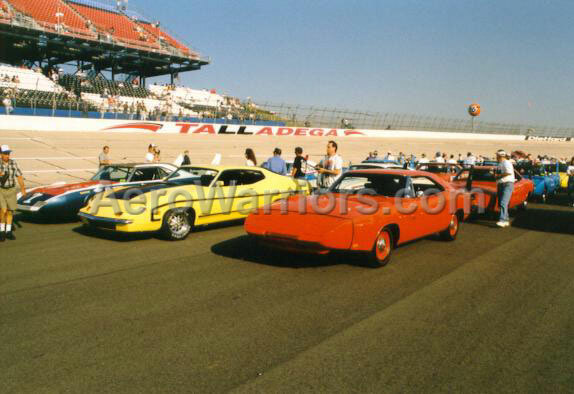 When the grandstand population was considered along with those watching from the infield, the crowd viewing the parade lap probably exceeded the total number to see the inaugural Talladega 500 on September 14, 1969! And during this portion of the parade procession, the public address announcer was informing the spectators about the cars and their historical significance. Unfortunately, as the group neared the first turn, there was a minor incident as one Daytona lost a wheel and its brake drum struck another Daytona; both cars were eventually able to proceed and both finished the lap without further incident. The over 100 member line of cars slowly slinked through turns one and two and down the endless backstretch. Upon approaching turn three, the aero cars navigated the long right turn off the track and back to the fenced staging area. This time the cars formed two long rows, parking in parallel along fences on either side. This was where the cars parked during the race while their owners were in the stands. 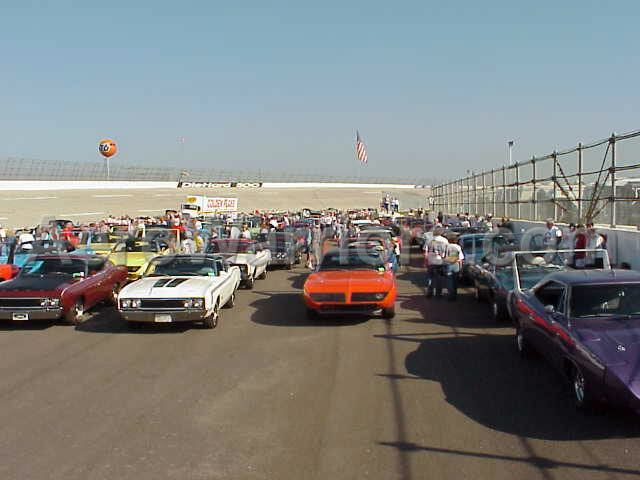 The October, 1999 Daytona-SuperBird Auto Club newsletter reported that 56 SuperBirds, 26 Daytonas, sixteen Talladegas, ten Cyclone Spoilers and two Charger 500's made the trek around the track. A majority of the Reunion folks opted to stay for at least some portion of the race, which was eventually won by Dale Earnhardt. Still others were on their way home shortly after completion of the parade lap. It was said that this would be the last Reunion in conjunction with the running of a NASCAR race at Talladega, but of course only time will tell. Hopefully there will be others, but if this really was the last one, it certainly was a grand note to end on! 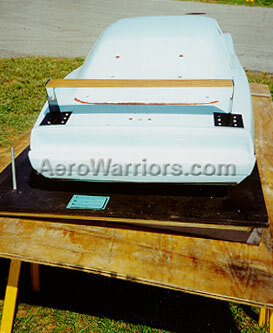 The following Aero Warrior Reunion Thank You's was authored by Doug Schellinger, and it appeared in the October, 1999 edition of The Hightailer, the newsletter of the Daytona-SuperBird Auto Club. In addition to those mentioned below, Doug Schellinger deserves many thanks for the countless hours he spent preparing for this and past Reunions. Tim Wellborn - Thanks for your years of work in putting three of these events together - 1988, 1994, 1999: It's an awful lot of time, phone calls, driving and just plain aggravation some times. But your years of work do not go unnoticed. JoAnne Nabor - Thanks for making the extra special name tags for the event. You went WAAYY overboard and we're glad you did. Mark Moses - Thanks for keeping track of the Ford cars. You're single-handedly responsible for the strong turn out at the last two reunions. Mike Atkins - Thanks Mike for bringing that big hauler, and for taking care of Wayne Perkins' damaged Daytona. Rex Whinery - Thanks for taking up a collection Sunday morning for Wayne's Daytona restoration. The people at the International Motorsports Hall of Fame and Talladega Superspeedway - Thanks for the use of your facility, especially on Saturday after our change of venue. Thanks for the complimentary tickets to the ARCA 300 race on Saturday. Our guest speakers: Gary Romberg, Harry Lee Hyde and Don Tarr. Thanks for taking time to share your experiences and memories. Lastly - Thanks to all of you who came to the event. Hope you had a great time!